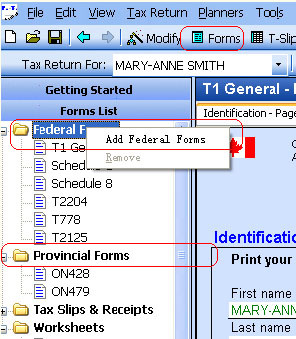 You can add or remove forms using the toolbar, or by right-clicking the mouse on the left hand pane. Mandatory forms cannot be removed, for example, T1, SCHEDULE1, SCHEDULE10 (if tax province is Quebec) and provincial tax/credit form 428 and/or 479. Green colored fields don't accept direct data input. Double clicking or pressing F2 on those fields will bring you corresponding forms/slips. Data will be filled into the green colored fields automatically after you fill in the corresponding forms/slips. An alternative way to fill in green colored fields is to add the forms/slips if you know the fields to which the forms/slips correspond. See the section Add or remove forms (#1) above.